Worlds Top Angler - 1v1 competition to be the true Worlds Top Angler in AnglerWars.. Who will it be? Do you have what it takes to really be the Top Angler in this smash hit Angler Wars game! With hundreds of items and missions there is no shortage of things to do. Play with your friends in Facebook. Compete 1v1 against someone or as a team. There are many types of career paths to follow in this awesome social game. Each character has its own special power and bonus in World's Top Angler! Fly Fisher - Ever want to spend the day casting away in that special spot? Well you can do just that and have some special items of your own as well that are not shared with any other type of angler. Ocean Fisher - Go big or go home! Do you have what it takes to catch the worlds deadliest catch in World's Top Angler? This character has some hidden abilities that only you will know about as you level up through the seasons. 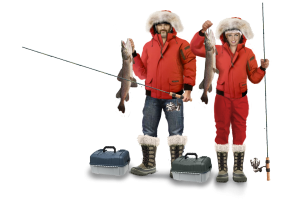 Ice Fisher - What would an angler game be if you couldn't step into the snow and hang out in your shanty? Expect some really cool items and perks for this character as well! Run missions to gain cash & stronger items, add your friends to have a stronger team, start a boat crew for extra an extra bonus! Get even by 1v1 first person shooter style competition! Sabotage someone's boat or Rig a Tournament and claim there prize by your self! World's Top Angler has been designed & developed for entertainment purpose only.